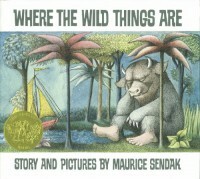 This book is and always will be one of my top favorite children's books. I was read it every year in elementary school and was not shocked to see several of the first graders in my placement class reading it as well. It tells the story of a young boy who gets sent to bed without dinner so he decides to run away. He ends up in a land full of monsters and ends up becoming their king. Before the story end, he begins to miss his family and goes back home. This story could be used for a writing prompt about what students would do if they ended up in the land of monsters that Max found. They could illustrate what they think the land would look like.